It's easy to learn how to build a patio. Even if your only experience with tools is a few minor home repairs, you can create your own backyard haven. Lay your patio when the ground isn't frozen or saturated from rain, plan two days to build your patio and be prepared to get dirty and sweat. Patios can be made from many different material including brick, wood, concrete, flagstone, pavers and plastic tiles. Some of these are more difficult to build than others. This article discusses two patio surfaces that are easy to moderate to build: brick and interlocking plastic tiles. Will you use the patio for grilling or just dining? Do you want easy access to the back door or a slider? Do you want to relax on a hammock and admire your garden? Do you live in a warm climate where you will get year-round use of your patio? Are you in a desert area where you need to consider UV stability for your patio surface? Or do you live in the Northern part of the country where temperatures hit high and low extremes? What about precipitation? Are snow and rain an issue? Will you use the patio at night or only during the day? Think about the sunny and shady spots in your yard and decide how much of each you want on the patio. Is there a buggy part of your yard? If you plan to use the patio at night, avoid putting it near plants and water that attract mosquitoes. Answering these questions will determine what material you should choose and where you should place your patio. Brick is an attractive choice for a patio. It looks very nice with older homes and colorful gardens. It is also a good choice for climates with extreme weather variations. Choose your location and the desired size of your patio. Measure the borders and outline the area in chalk. If your patio will be a square or rectangle (much easier to build than a circular patio) use a level to be sure the sides are even. Loosely lay the bricks in the outline to be sure you have enough material and to determine what kind of pattern you will use. Bricks can be laid in a basket weave patter,n where two bricks are set horizontally and then two vertically across the entire surface. They can also be laid on alternating angles in a herringbone design. Remove the brick and lay crushed stone inside the outline of your patio. Flatten the stones. This is called tamping. Lay a weed barrier, such as landscaping fabric, to keep future weeds from popping up between the bricks. Pour sand two inches deep on top of the stones. Tamp the sand. Lay the bricks in the pattern you previously worked out and bang them into the ground with a rubber mallet. Pour sand over the bricks and sweep it into the cracks. Do this as many times as necessary to fill the cracks. 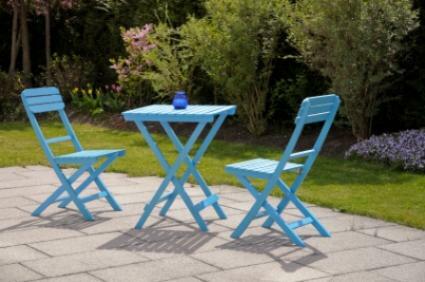 Interlocking polypropylene and PVC tiles are an easy patio option. They can be easily removed should you decide to replace or move the patio. Avoid PVC in extreme temperatures, as it will contract and expand. Ideally, you should use a UV-stable polypropylene tile that is fully recyclable. To get started, follow steps one through five above, then click the tiles into place and use a rubber mallet, if needed. Enjoy your new patio!